Clicking on the print icon in Month view will generate a view optimized for one-page printing, and has been tested in major browser versions of Internet Explorer, Firefox, Chrome and Safari but individual printer and system configurations may require adjustment for proper printing. Here are a few hints to ensure successful printing. Clicking on the print icon in Plan View will generate a view optimized for up to 165 campaigns per year. If you have greater than 165 campaigns displayed in your selected List View for a selected year, Campaign Calendar will still generate a PDF for the first 165 campaigns in the list. 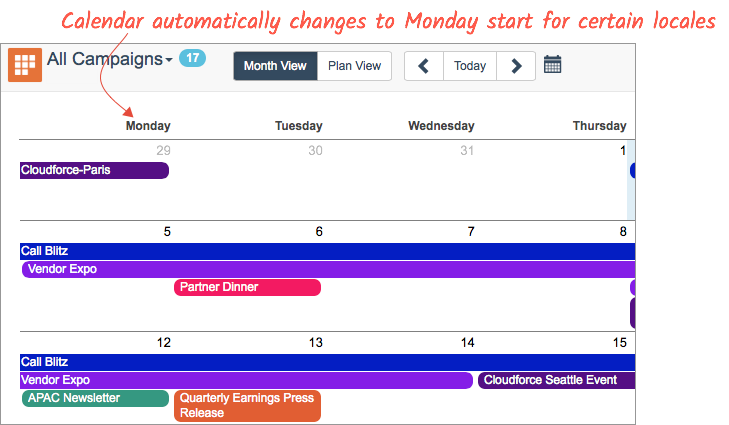 Hover over the color icon to display the calendar color legend. The legend will display the field that the colors are based on as well as the individual field values. The legend can be controlled by the Company Color Settings or by your own Personal Color Settings. Special permissions are required to customize the Company Color Settings, but any user can define Personal Color Settings. For more details on the permissions necessary for the Company Color Settings see the Campaign Calendar Customization guide. Campaign Calendar users who do not have the supplemental Color Management permission set assigned to them can still change the personal color legend by following the same steps as above. Modifying the Personal Color Settings only affects the user's personal color legend. This will open the Color Settings Window. Step 1: To manage personal color settings, select Personal Color Settings. Clicking on the ICS icon will download an ICS file containing the Campaigns present in the current list view. This ICS file can then be used to import into other calendaring tools such as Google Calendar or Outlook. Clicking on the Download ICS button inside the Campaign Details will download an ICS file for the single campaign. Campaign Calendar automatically detects locale and switches to a Monday start where applicable.